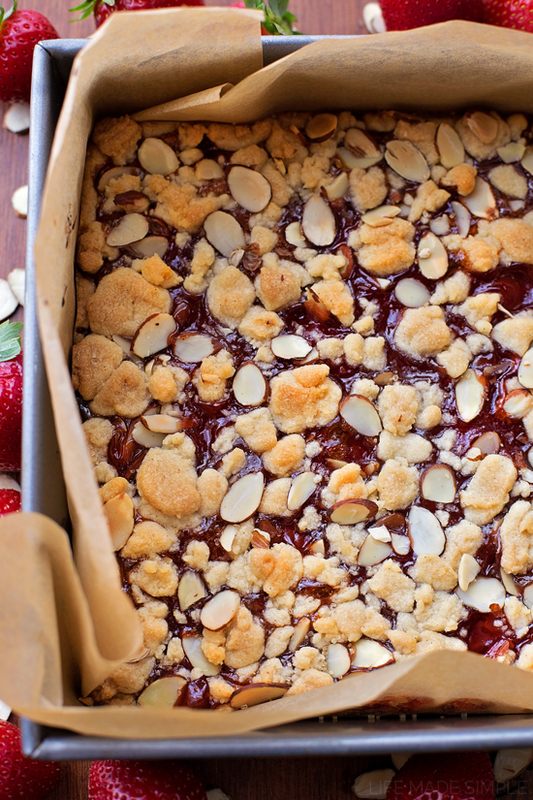 You guys, I’ve been baking all sorts of goodies for you this past week, including these strawberry almond shortbread bars! Have you ever made shortbread at home? It’s so easy! This was my first time and it was so much easier then I had anticipated. 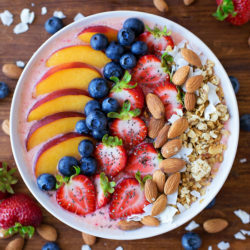 With only a few simple ingredients I was able to whip up a pan of these gorgeous fruit-filled beauties, and so can you! 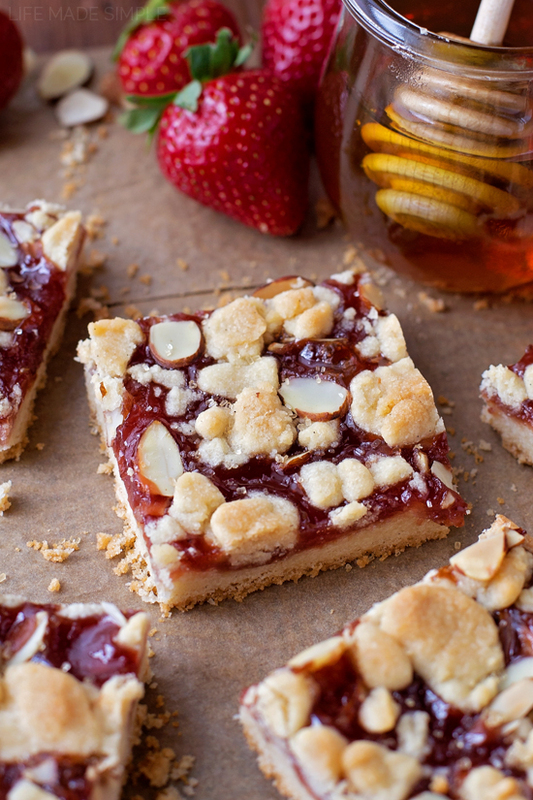 These shortbread bars are perfect for any time of the year, but especially during the holiday season. 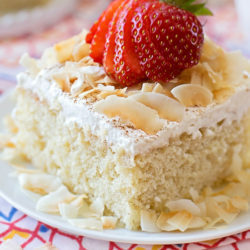 They only take a few minutes to make and look & taste absolutely amazing! 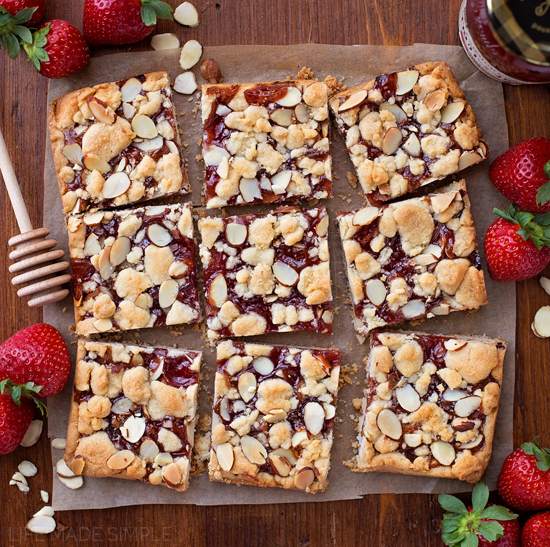 That’s largely due to the strawberry spread I used, it just happens to be naturally sweetened with honey. ???????????? You can find four varieties of J.M. 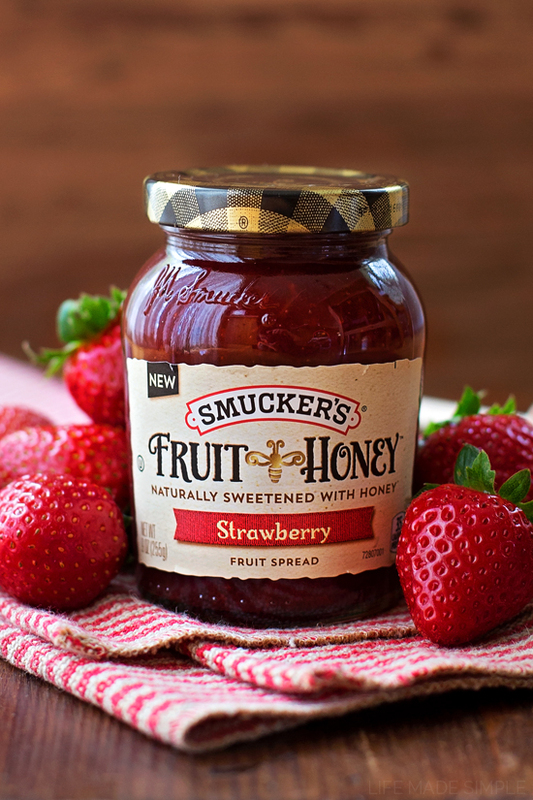 Smucker’s® Fruit and Honey at most big box stores like Walmart. I can’t wait to use some of the other spreads in muffins, homemade toaster strudels, vinaigrettes, and linzer cookies!!! The options seem endless! ???? Back to the bars. To make the base, simply beat some sugar and butter until it’s light and fluffy. 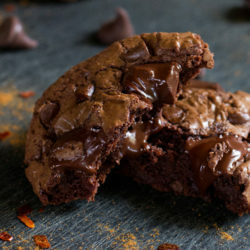 You’ll definitely need a stand or hand mixer to achieve the right consistency. Add a bit of vanilla bean paste (or extract) and almond extract to it and then gradually add in the salt and flour. When a soft dough forms, remove about a half cup and freeze it till it’s nice and firm. Press the remaining dough into a parchment-lined square baking pan and then smooth the spread over top. 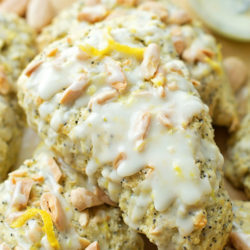 Crumble the frozen dough over top and sprinkle a handful of almonds over it all. Place in the oven and bake until golden brown. The shortbread should take about 45 minutes. As soon as it comes to room temperature, remove it from the pan (I like to use the edges of the parchment to pull it out) and slice it up. You can cut bars, squares or even triangles. 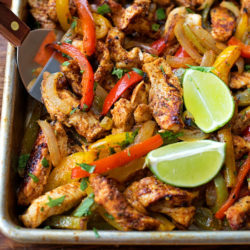 One pan can yield up to 16 servings! I can’t wait to make these again to give to friends and neighbors along with our other traditional Christmas cookies this year! 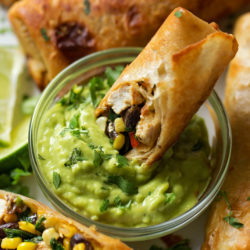 They’re easy, delicious and absolutely stunning. 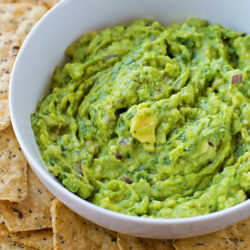 Make sure to grab a coupon for $1.00 off any of the four spreads! 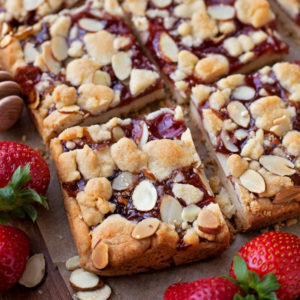 These strawberry almond shortbread bars are easy to make and taste absolutely incredible! They're the perfect treat for just about any time of the year. Preheat oven to 350 degrees. Line a 8-inch or 9-inch square baking pan with parchment paper, set aside. In a large mixing bowl or the bowl of a stand mixer, beat the butter and sugar until light and fluffy, about 2-3 minutes. Add the vanilla paste or extract and almond extract, mix just until combined. With mixing speed on low, gradually add the flour. Mix until a dough forms. Remove ½ cup of the dough and press into a flat disc and wrap in plastic wrap. 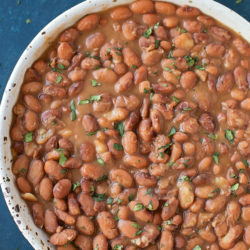 Place in the freezer until firm, about 10 minutes. Press the remaining dough into the bottom of the prepared pan, use the palm of your hand to create a flat, even layer. 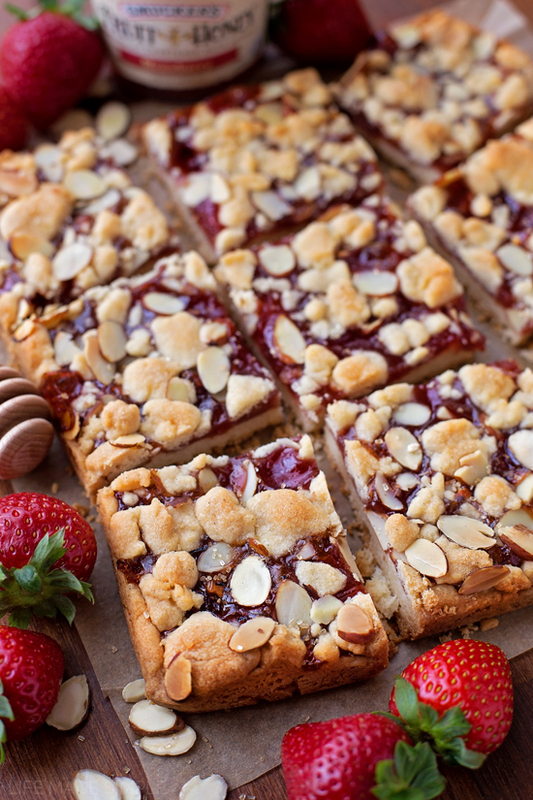 Use a spatula to smooth the strawberry spread over the dough, leaving a ¼-inch border. 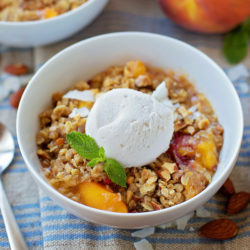 Crumble the frozen dough and sprinkle it, along with the almonds over top. Place in the oven and bake until the dough turns lightly golden brown, about 45-50 minutes. Remove from the oven and allow the bars to cool to room temperature before removing from the pan. When the jam is set, cut and serve. 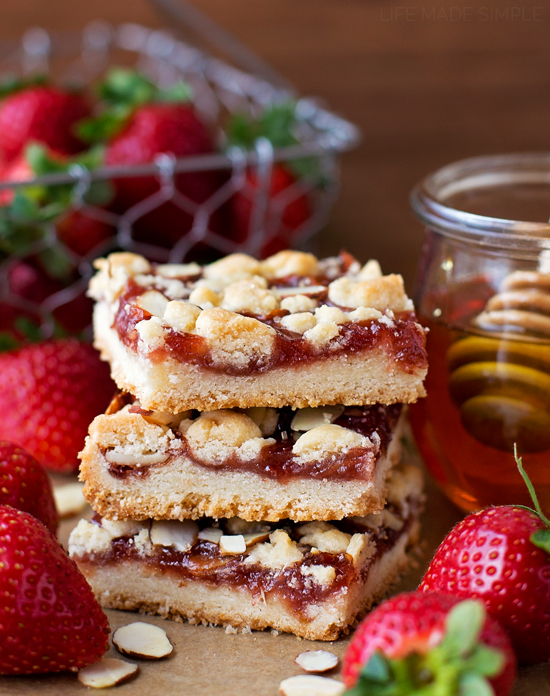 -You can use any flavor of jam for these bars!